As a lifelong Blues fan, what was your reaction when the “clown suit” jerseys with the diagonal stripes were unveiled in June 1994? Can you describe a bit of the alienation that took place between the Blues and the fan base as a whole between the 1994-95 season and the 1996-97 season? There are references in October 1996 that it would be ready to go after the All-Star Game in 1997. Who had commissioned the design on them? Who decided that they would be quietly withdrawn (in that there was no announcement or press release detailing as such) without ever seeing the light of day? What was the time frame on when the decision was made to withdraw them? Was there actually a set of game jerseys that was received and prepared for use before they were squelched? How many exist outside of the original prototype? 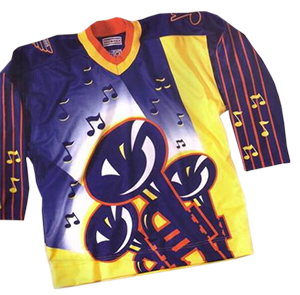 Was the withdrawal of the vertical trumpet jerseys related to a perception issue, that this would simply be (like the “clown suits”) a visual reminder of an era that most within the team would prefer to forget? When you were hired by the team, was a suggestion made by you to change the on-ice look or was it a mandate that was handed down to you by the new Blues’ braintrust? You mentioned in an interview that ended up in an article that the NHL had helped fast-track the white alternate onto the ice. Can you explain a bit about this process, and the league’s reasons for doing so? Barely one year after being hired by the team that you were a lifelong fan of, an actual jersey that you had a big hand in getting onto the ice made its debut to rave reviews. Can you explain a bit of the emotional side of things of what it was like on a personal level to see this, as well as on a fan level to make such a clear and decisive break from the Keenan era? Thank you for your time. I look forward to hearing back from you.